I'm sitting here thinking about the day I decided we (Dotty and me) would start living our life the ways we always had. I was coming to an important realization -- I was allowing Mr Alzheimer's to dictate the way we were living. The more I thought about it the more I realized we were living in a cave. A cave of our own making. It was easy to think and conclude -- Dotty can't do this and she can't do that. As you might imagine, this lead to a mighty lonely existence. I put a circle around those words and started to think. By the way, the idea just came out of me. Out of someplace in my head actually. Next, I started writing down the things that Dotty and I liked to do in the old days. In the old days when Dotty visited me in New York, or when I came to visit her in Delray Beach. Just the thought of the things that Dotty and I would do was very uplifting. I smiled then, and I am smiling right now. These are pleasant thoughts. One thing I was already doing was strengthening up Dotty in the gym. Working mostly on the strength in her legs and her balance. The only reason we started working on her chest and shoulders was because one day Dotty just jumped on the exercise machine and started to mimic what she saw other people doing as she walked on the treadmill. You can call Dotty crazy but she likes the weight machines more than the treadmill. Actually, she hates the treadmill. Seems backwards to me, but that is Alzheimer's disease for you. One thing I wrote down and decided to do was get Dotty on to the beach and down to the water. I knew this would be an accomplishment. Not to get her on to the beach, but to get her to walk through the sand all the way to the water. Keep in mind, before the gym Dotty couldn't walk a block on concrete. Its more than a block from the edge of the beach to the water and she would have to walk in the sand. I put her on the treadmill, then on the leg machine, and we started working toward our big day at the beach. Once I thought she was ready I told her, Dotty we are going to the beach. She smiled and actually said, "its about time". You gotta love Dotty. Once we arrived at the beach, it did take a long time to make it to the water and then back (I was more worried about getting her off the beach than on the beach). We stopped quite a few times so Dotty could catch her breath and rally her strength. I can tell you this, Dotty was determined to make it. I could tell by the look on her face. The light bulb in my head was starting to burn bright. This all happened as my own metamorphosis as an Alzheimer's caregiver was beginning. Someone told me I do things the exact opposite way it says to do them in the books. Well, I never read those books. I observe, I think, I feel. I'll try anything that makes Dotty smile; and therefore, improves my caregiver day. I know there are constraints but I continue to believe Dotty and I can do most things we put our mind too. I forgot to mentioned. We worked about six months in the gym before our big day at the beach. Nothing happens overnight when you are dealing with Alzheimer's disease. Its like slow motion living. However, if you become determined and you are persistent it is going to happen. By that I mean, it can and will happen to you if you try. Let me ask you? If you are a full time caregiver what else do you have to do with your time? How about working on something productive each and every day? You have to learn how to walk before you learn how to run. Alzheimer's is a long distance race. I told Mr Alzheimer's -- take a hike. LEONARDO'S NOTEBOOKS ARE STILL BEING ANALYSED TODAY FOR NEW INVENTIONS AND DISCOVERY! 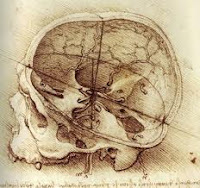 Leonardo's anatomy drawings are so perfect in their depiction of the human dissection on adetailed level to this day, that many of his drawings are still being used in scientific illustration. Any inventions in the myriad of subject fields he ventured into were so far reaching into the future that his notebooks are still being fine-combed for new discoveries. Scientists are hoping to locate possibilities that have not yet been realised even over 480 years after his death. Scholars who would have not taken him so seriously when he was still alive are venerating Leonardo. The notebooks under inspection include anatomy sketches, which are under the magnifying glass of professional clinical surgeons and scientists.